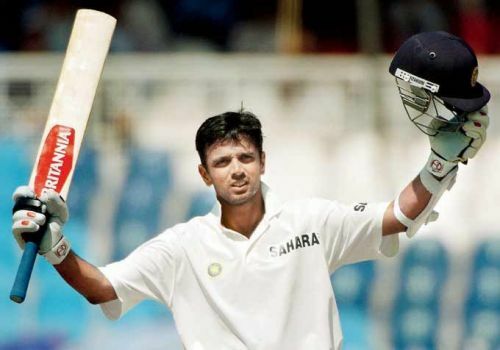 India's iconic batsman, Rahul Dravid celebrates his 45th Birthday today. The man who contributed to Team India in every possible way. He will be your opener, Number three and middle order batsmen. That's the kind of flexibility he brought to the team. He kept wickets during the 2003 World cup though he wasn't a professional wicketkeeper. This ensured a balanced Indian team that played in the 2003 World Cup. Dravid has always been a unique personality who offered whatever he could for the team. His dignity and discipline towards the game and on-field conduct have earned him a huge fan following. He is the role model for many youngsters who look up to him on how to carry themselves both on and off the cricket field. The Wall, as he is fondly called, is currently nurturing the young Indian team and producing many talented cricketers for Indian cricket. There are numerous records against to his name, however, there are certain records of him you might not know. Let's see three such records. Dravid has played many second fiddle innings during his illustrious career. Hence, his centuries have gone unnoticed. Sachin Tendulkar and Dravid are the most prolific pair in the Test cricket's history. They hold the record for scoring most runs by any pair in the longest format of the game. Both scored 6920 runs at an average of 50.51. They have 20 century stands together in their Test career which is also most by any pair. This record may not be broken in the near future as no active pair is anywhere close to this record. Among the active players, Ross Taylor and Kane Williamson have 2926 runs between them which are most for any active pair. So, the record will be safe at least for 10 years as they are not likely to come near to this prolific Indian pair.